(MTV) -- The Coachella festival is a place where minds routinely get blown, usually due to an awesome set or a killer reunion from one of your favorite bands. 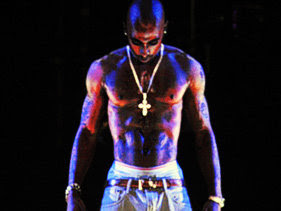 But on Sunday night it was thanks to the ghostly re-appearance of West Coast rap legend Tupac Shakur. He materialized on stage alongside his old friend Snoop Dogg during a crowd-pleasing set by the Doggfather and Dr. Dre, which also featured appearances from Eminem, 50 Cent, Wiz Khalifa and Warren G.